What’s Coming Out of the Pockets of Recent Graduates? As knowledgeable American citizens, we are fully aware that the young adults in our country are suffering the most from our weak and lack-luster job market. They have student loans to pay, they can’t find jobs that suit their finances and most have to bite the bullet and move back in with mom and dad. For the 20-somethings of today, it’s a rough battle with the job market. 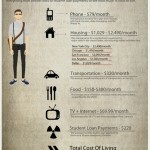 That is why this infographic from Visual.ly that maps out the expenses of recent graduates is particularly interesting. Take a look. Many argue that the priorities of young adults are a bit out of whack. They spend tons of money on entertainment and defer their student loans because they cannot afford to pay them off just yet. (Am I talking about my personal student situation or the general consensus here?) Either way, young adults have it pretty hard. 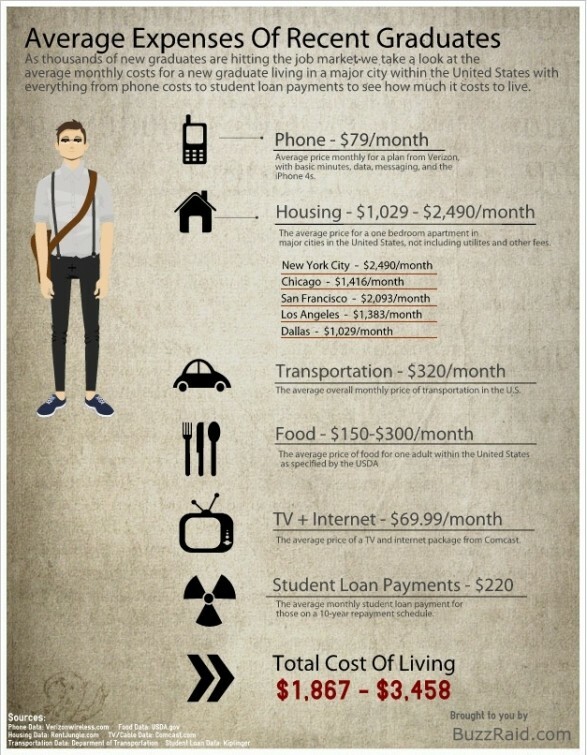 According to this infographic, recent graduates today spend an average of about $3,000 a month. It’s important to note that this figure greatly applies to those living in large metropolitan areas, but that’s a good chunk of young adults today. With a $75 average phone bill and student loan payments of at least $220, it’s not difficult to see how they are heavily treading water and probably drowning. When you add transportation and food, there’s likely no money left at the end of the month. With such high expenses and less jobs for those at their experience level, it’s clear that this group needs some help. Perhaps Obama’s attempt to rectify the student loan issue will aid this group a tad, but it’s more likely that these young adults need jobs, jobs, jobs- much like the rest of the country. Are you a young adult living with these kinds of expenses? Do you live in your own place or did you move back home to your parent’s home to save money? Let me know in the comments or tweet me @nicole_spark.